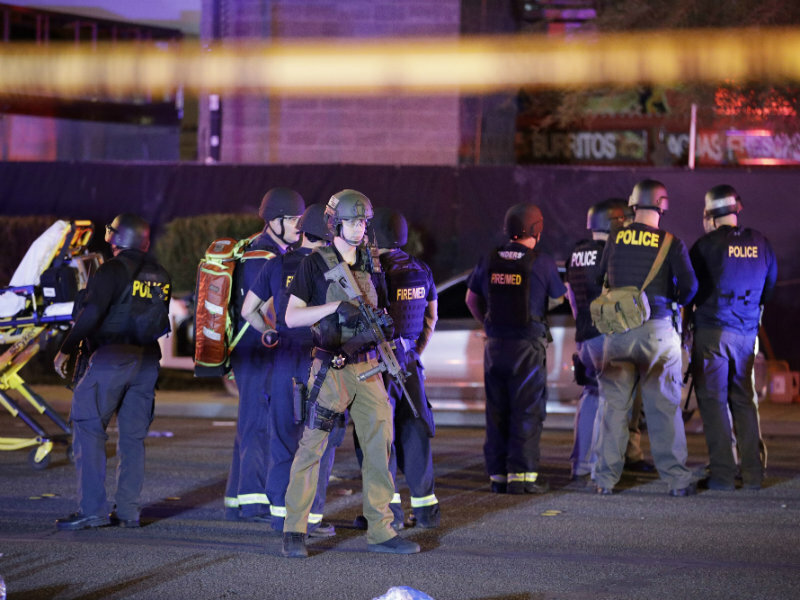 By Tom Kertscher on Monday, October 9th, 2017 at 6:00 a.m.
Police officers and medical personnel stand at the scene of a shooting near the Mandalay Bay resort and casino on the Las Vegas Strip, Monday, Oct. 2, 2017, in Las Vegas. Multiple victims were being sent to hospitals after a shooting Sunday. AP photo. The mass shooting in Las Vegas on Oct. 1, 2017 prompted Wisconsin politicians to make statements about shootings and guns. We fact checked three of them. Here’s what we found. The Las Vegas shooting was the "273rd mass shooting" in the United States so far in 2017. U.S. Sen. Tammy Baldwin, D-Wis., cited a source that arrived at that figure using a very broad definition of mass shooting, to include gang violence, street fights and other incidents unlike the random shooting seen in Las Vegas. Other sources use narrower definitions that yield much lower counts. In Wisconsin, "we have a bill that would allow hidden, deadly weapons -- every single person to carry one -- no training, no background check, even around schools." The "every single person" part of the claim by state Rep. Chris Taylor, D-Madison, needed clarification, in that not every person, particularly felons, can legally possess any type of weapon. But Taylor was correct that if the bill becomes law, people could generally carry concealed weapons without getting a license -- which would mean no background check or training would be required, either. And even felons could conceal carry certain weapons, such as antique or replica guns. As for around schools, anyone who can legally possess a firearm could generally carry it concealed within 1,000 feet of a school, under the bill. 90 percent of Americans "support universal background checks" for gun purchases. "Universal" is the term for background checks to be done on every gun sale. We found, in checking the claim by Milwaukee County Executive Chris Abele, that support for that policy was at 94 percent in the latest national poll. Support ranged between 84 percent and 89 percent in the four other most recent polls, dating back to January 2016. Experts say support at or near 90 percent has been consistent for years.